During this first year (Apr 01st – Sept 30th 2016), the USAID/CINSERE activity has been technically launched through a workshop that gathered key stakeholders of the project. This allowed assessing the specific needs in Climate Information Services (CIS) of the 4 Feed the Future (FtF) projects and the possible communication channels that could be used to disse- minate the information to benefit farmers, pastoralists and fisher folks. Also, the Advisory Committee of the project has been formally setup during its first meeting concomitantly organised with the official launching ceremony with attendance of high level authorities (HEM Ambassador of USA, Secretary General of Ministry of Agriculture and Rural Equip- ment and of Ministry of Tourism and Aviation Transport). A roadmap for the Advisory Com- mittee’s activities has been developed, in line with the timeline of USAID work planning and reporting for projects. The recruitment of the project staff (Project Coordinator, M&E Specialist and Climatologist) is now completed and the contract between ICRISAT/CCAFS and ANACIM has been signed. This allowed to capacitate ANACIM to start developing and communicating tailored and salient CIS in support of farms’, fisheries’ and pastoralists’ communities, including members of both sexes, in their management decision making. The above actions allowed to roll out the planned ground activities for the rainy season 2016. The main achievements in the ground include 1) the setup of 17 local multi-disciplinary working 4 groups (MWGs) in 8 regions covered by Naatal Mbay and Yaajeende projects; (2) training of key stakeholders that will disseminate CIS within each of the FtF projects (Stakeholders from government, NGOs, CBOs, private sector, etc. ); (3) Dissemination of CIS to benefit farmers, fisher folks and pastoralists. Ouedraogo I, Diouf S. 2017. 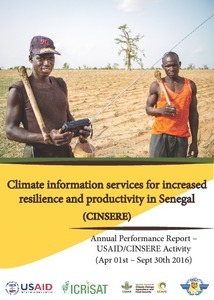 Climate information services for increased resilience and productivity in Senegal (CINSERE): Annual Performance Report – USAID/CINSERE Activity (Apr 01st – Sept 30th 2016). Dakar, Senegal: CGIAR Research Program on Climate Change, Agriculture and Food Security (CCAFS).